The flag of the region of Wessex was registered on May 20th 2011. It is based on historic accounts of a golden dragon, military standard, borne in battle by the West Saxons in wars against Mercians, Vikings and Normans alike. 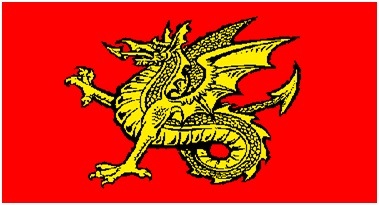 This dragon battle standard represented the early kingdom of Wessex and by virtue of its use by the English army at Hastings, is often considered to have been England’s first national flag. They were also used by the Dacians and the Parthians as a military ensign in their clashes with Rome. These were comparatively elaborate affairs, more a “windsock” than a modern flag. The hollow head, in the form of a toothed dragon, was formed from metal while the body was composed of strips of cloth sewn together in a serpentine form that, filled by the wind when horses were at a gallop, would make a hissing sound! The Romans adopted this device as the emblem of a cohort, the bearer of the device was termed a draconarius. Several centuries later, when the Romano-British territory was in the grip of the Anglo-Saxon invasion, warlords, as epitomised by such shadowy figures as Ambrosius Aurelianus and King Arthur, would have confronted them in familiar Roman style, including use of the Roman military cohort standard. 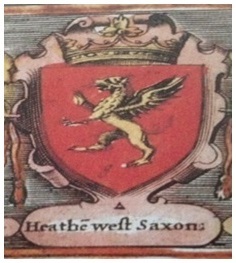 The Saxon forces who formed the kingdom of Wessex would have therefore encountered this standard and likely adopted this emblem from them, either as a symbol of their ultimate triumph over their enemy or perhaps in simple recognition of the device’s intrinsic splendour. The evident significance of the dragon theme in both Celtic and Germanic culture would have made the take up of such a military standard an easy adaptation. In his 1982 article “The Dragon Of Wessex” in local history periodical, “Earth Giant”, Jeremy Harte describes how the Byzantine successors of Rome also made use of dracontine standards and that the practice was taken up by western armies such as that of Charlemagne. The front cover of the publication, reproduced from a ninth century manuscript from the monastery of Saint Gall, Switzerland, features a depiction of a biblical scene showing King David riding out to meet his enemies but reflecting the contemporary appearance of Charlemagne’s military including a dragon standard. “…He quitted his royal station which as wont, he had taken between the dragon and the ensign called the standard”. 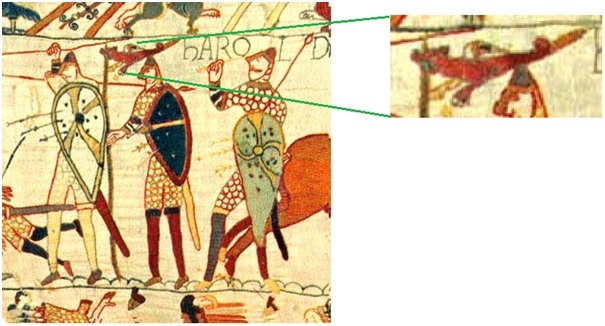 Such dragon standards are also seen borne by the English army, on the Bayeux tapestry. 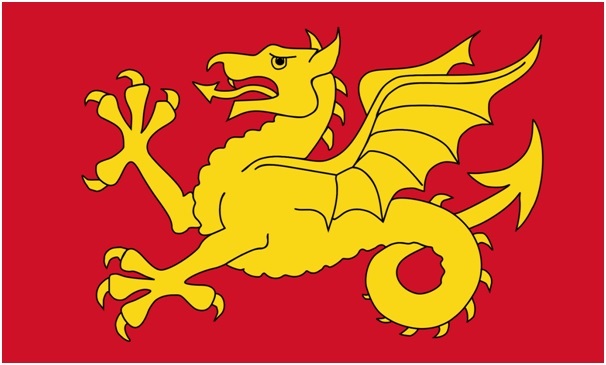 After the Battle of Hastings the victorious Normans also adopted the dragon standard – it was used by Richard I, Henry III, Edward I and Henry V. Mediaeval writer Richard of Devizes wrote of Richard I’s crusade “The terrible standard of the dragon is borne in front unfurled”. It is further recorded that at Crecy, King Edward III raised his “unconquered standard of the Dragon Gules (red)” and that it appeared yet again at Agincourt. 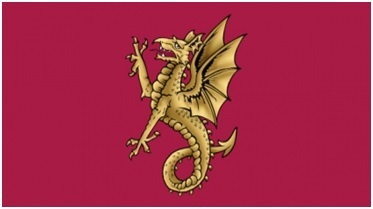 It is sometimes asserted that by virtue of its appearance at the Battle of Hastings as the standard of the English army, the golden dragon flag was effectively England’s first national flag. and in the border of the map of the Anglo-Saxon heptarchy – where one of the depictions shows it wielded by Cerdic, founder of the ruling dynasty of Wessex. , bearing a blue mace as a symbol of the council’s authority. 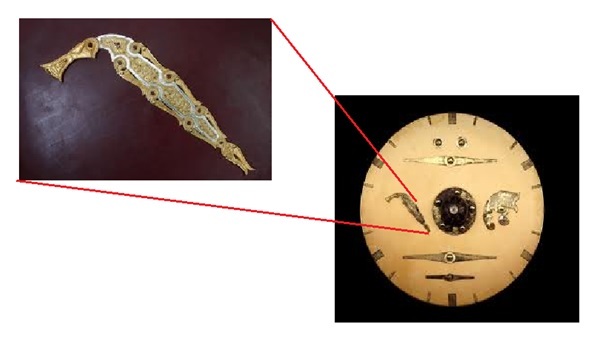 is likely to be a more faithful representation of the actual form of standard used in this era, more akin to the “flying serpent” notion, this term being an alternative name for dragon in the mediaeval era. 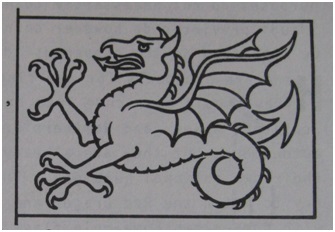 Indeed the word “wyvern”, derived from Middle English “wyvere” meaning viper, is more descriptive of the elongated windsock shape of these early standards. The beast is basically a dragon with only two legs but having wings and a barbed tail, it is a heraldic development of early dragon devices. 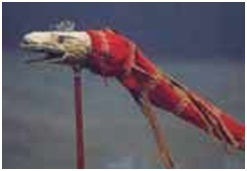 In the Anglo-Saxon era such a fine distinction between two and four legged, winged scaly beasts, on the top of a spear, would not have existed but over the years the depiction of a two-legged dragon with a serpentine body, has become the specific, recognised emblem of Wessex. 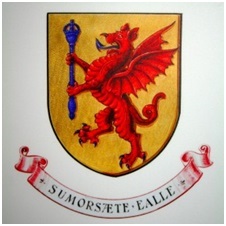 The emblem has had a consistent association with the region, especially with military units associated with it – appropriate, considering the use of the dracontine standard in several of England’s major military engagements. and had it adopted as the badge of the British army’s 43rd Infantry Division. 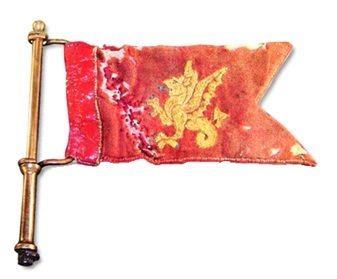 used by a divisional commander, whilst in operation near Arnhem in July 1944, shows the gold wyvern embroidered directly onto a red fork-tailed pennant which has been the distinguishing flag of divisional commanders since early in the 20th century. 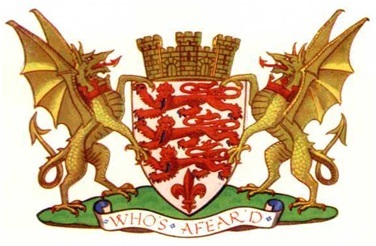 Clearly for a wyvern to have been chosen as the divisional emblem because of its Wessex linkage, there had to have been an already strong and obviously recognised association between the wyvern and the Wessex region. when worn on the sleeves of the soldiers serving in the division. 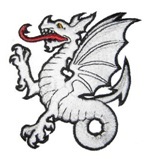 is today, also the badge of The Wessex Reserve Forces’ & Cadets’ Association. 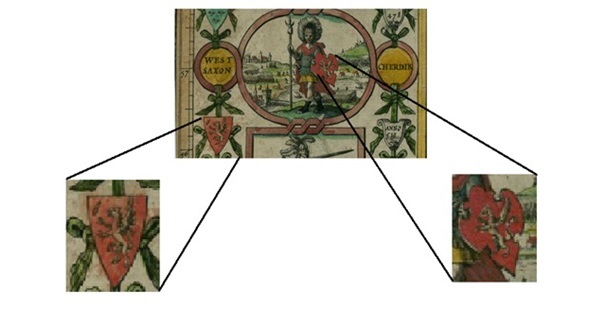 appearing as supporters in the arms of the first Duke of Marlborough, first left above; the crest in the arms of Midland Railway, second from left; the crest and supporters in the arms of West Dorset council, located of course in Wessex, second from right; and in the first and third quarters of the arms used by that famous West Countryman and son of Wessex, Sir Francis Drake, right – who claimed the right to use the wyvern arms of a Devon family named Drake. 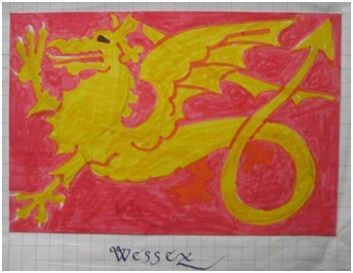 In the 1970’s, with the advent of local government reorganisation, the Flag Institute, under the guidance of William Crampton, investigated the potential for English regional flags, compiling ideas in a booklet entitled “Regional Flags For England.” Wessex was identified as one obvious region, for which the natural flag was the much attested gold wyvern. William Crampton made an early sketch of the design that he had in mind. , where its description reads “The gold dragon of the West Saxons is one of the few surviving emblems from the time of the Saxon kingdoms,”. Reference is then made to the continued appearance of the emblem, “…much use is made of its modern form, the wyvern, in personal, municipal and military heraldry. 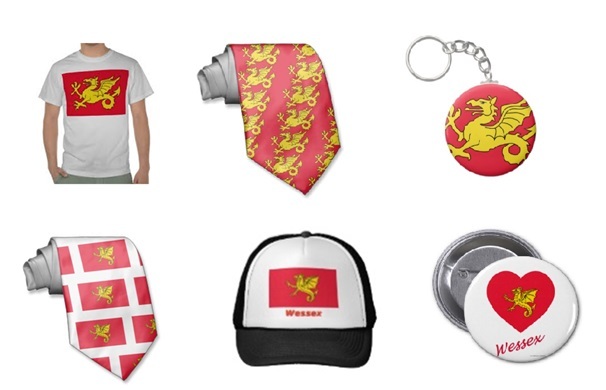 The field given is red and there is a tradition that a golden dragon on a red standard was carried into battle by the English up to the 15th century.” this, a reference to its appearance at Agincourt and other earlier military engagements, albeit that the dragon was described as red at Crecy! 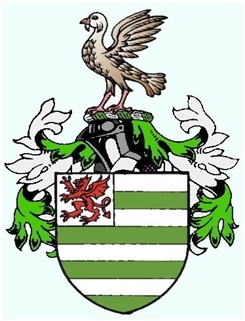 In the same year, a political party seeking a degree of legislative and administrative home rule for Wessex, named “The Wessex Regionalist Party, was established and in time adopted a green wyvern logo, realised in a form rather reminiscent of dark age artistry and incorporating rather runic looking letters forming the name of “Wessex”. 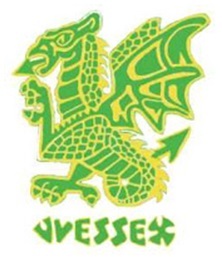 A green coloured emblem has also been adopted by the Wessex Morrismen, although curiously the body eschewed the traditional and near universally acknowledged, regional wyvern, for a four limbed dragon! 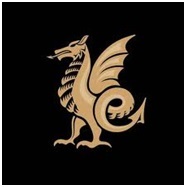 The next year (November 1975) a golden wyvern on a black background was raised over his Longleat home by Lord Weymouth, later Marquess of Bath, to mark a unilateral declaration of independence by Wessex! Two decades later it was revealed that the choice of background colour was rather arbitrary, based on what looked most effective, as well as just happening to be the lord’s livery colours! all likely to have been in token of the area’s links to ancient Wessex. In the early 1990s, Jim Gunter, an early member of the Flag Institute, introduced the membership of the Wessex Regionalist Party (WRP) to the Crampton design. He argued that, whatever colour the Party logo might be, the flag of the region itself would not be authentic without the red background preferred by most past authorities on the subject, as had appeared in the Speed illustration and as used again in the Crampton sketch. This view eventually prevailed. 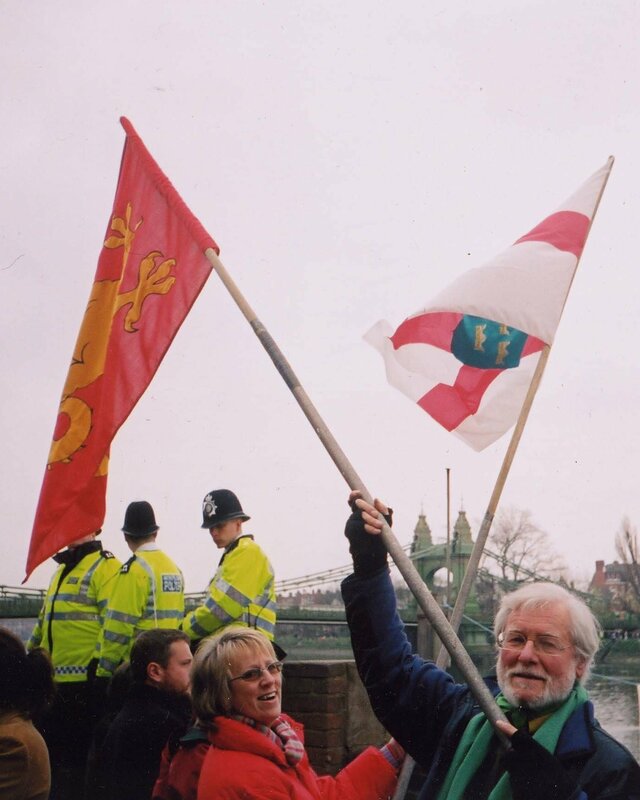 In 1997 David Robbins of the WRP commissioned the production of probably the first actual Wessex flag, utilising the Crampton design, which had its first public unfurling at Wells Cathedral that year, to welcome the Cornish marchers re-tracing the route of the 1497 rebellion. 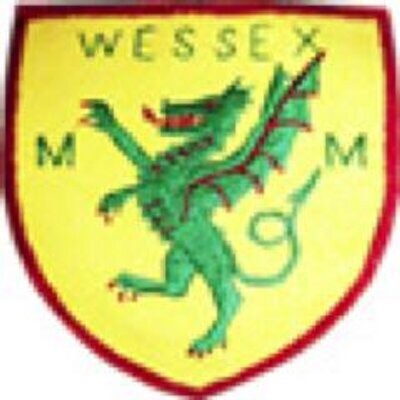 The Wessex Society was launched in 1999 by which time the Crampton design had become the de facto, recognisd flag of the region of Wessex, largely owing to the efforts of the society’s Nick Xylas, who created a digitised copy of the flag that spread across the Internet. In 2004 the flag was taken to the famous university boat race on the River Thames by one of the society’s members Colin Bex. The society deems Oxfordshire as part of the Wessex territory so used the flag to support the Oxford University crew. A Cambridge supporter wielded the flag of East Anglia, in which regional territory Cambridge University is located. In the following years the society encountered some difficulty flying the flag, hampered by bureaucracy and the reluctance of local officials. 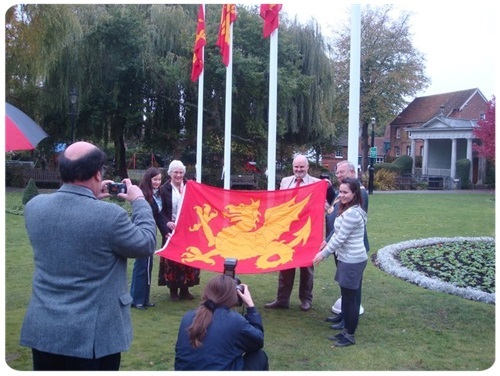 In 2010, the Wessex Society sought to raise its flag on the 1,111th anniversary of the death of Alfred the Great, the renowned king of Wessex. The society approached the Winchester Guild Hall to mark the occasion by flying for just one day, the flag of Alfred’s Kingdom. The proposal was initially turned down. 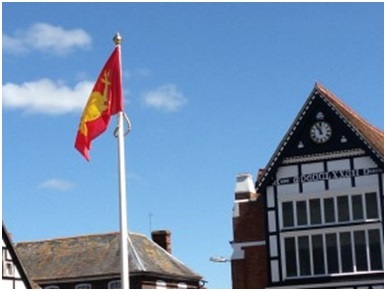 After considerable negotiation and assistance from the locally based S L S Group company, a compromise was reached and permission was granted to fly the flag in the grounds adjacent to the guildhall. Thanks to the generosity of S L S Group, four flagpoles, symbolising the four figure “1”s of the “1,111th” anniversary were erected, each bearing a Wessex wyvern. 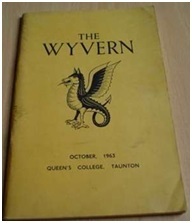 At this time Flag Institute member Jason Saber, contacted Derek Pickett, chairman of the Wessex Society, to suggest that the society seek registration of the wyvern as the regional flag of Wessex, to gain some official recognition and thus hopefully help to smooth over future complications. At that time the East Anglian flag was the only regional flag included on the registry but it was barely a century old, a comparative infant compared with the ancient flag of Wessex! The society duly requested registration a few months later, which was completed in 2011. Upon registration, the flag Institute’s Graham Bartram, refined some of features of the wyvern such as its talons, to make the image a little sharper and more distinct. 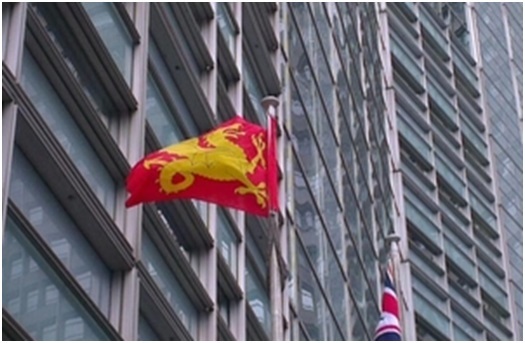 And the following year, on May 25th 2013, Wessex Day, (the feast day of Saint Aldhelm) the Wessex flag was raised over the Eland House Headquarters of the Department for Communities and Local Government (DCLG) in London. The status and recognition of the flag had increased considerably in a short time. 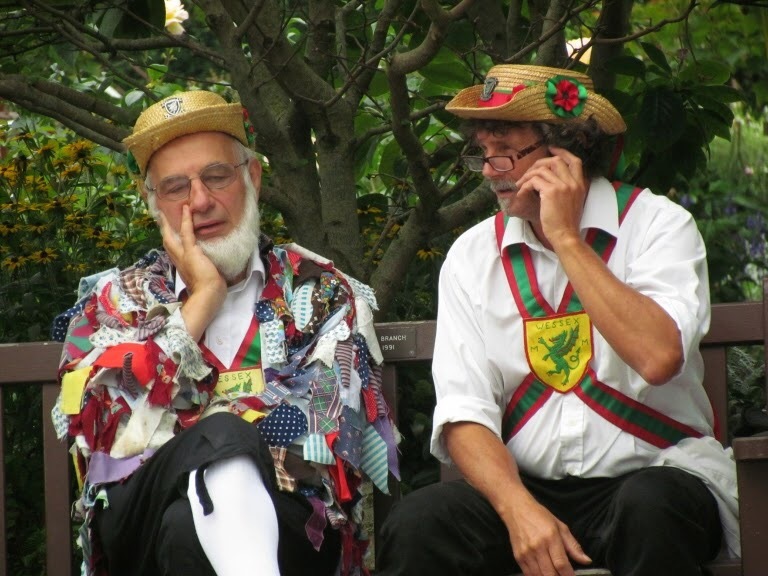 and again here on Wessex Day, May 25th 2014. 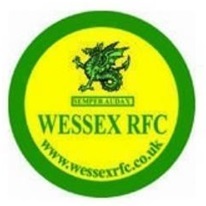 Another fine version of the Wessex flag, created by Chrys Fear, has also featured occasionally on Wessex related media, although it is not of course, the registered flag. Jeremy Harte, “The Dragon Of Wessex” ,1982. Acknowledgement and thanks are also due to Ian Sumner, Flag Institute librarian, for additional research and images, Dave White for his extensive research notes and David Robbins for supplying the 1982 edition of the periodical ‘Earth Giant’ and information on the recent history of the flag.